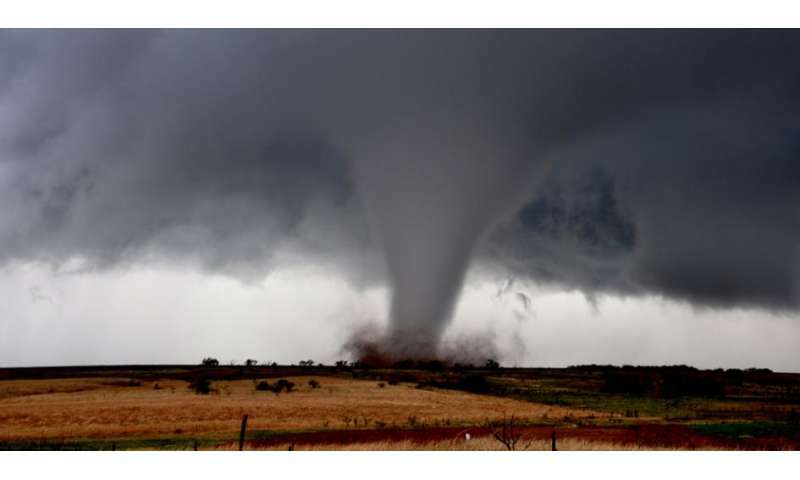 The frequency of large-scale tornado outbreaks is increasing in the United States, particularly when it comes to the most extreme events, according to research recently published in Science. The study by researchers including Joel E. Cohen, a visiting scholar at the University of Chicago, finds the increase in tornado outbreaks does not appear to be the result of a warming climate as earlier models suggested. Instead, their findings tie the growth in frequency to trends in the vertical wind shear found in certain supercells—a change not so far associated with a warmer climate. "What's pushing this rise in extreme outbreaks, during which the vast majority of tornado-related fatalities occur, is far from obvious in the present state of climate science," said Cohen, the Abby Rockefeller Mauzé Professor at Rockefeller University and Professor of Earth and Environmental Sciences at Columbia University, who conducted the research while a visiting scholar in UChicago's Department of Statistics. Tornado outbreaks are large-scale weather events that last one to three days, featuring several thunderstorms and six or more tornadoes in close succession. In the study, published in the Dec. 16 issue of Science, the researchers used new statistical tools, including extreme value analysis—a branch of statistics dealing with deviations—to analyze observation-based meteorological estimates associated with tornado outbreaks together with National Oceanic and Atmospheric Administration datasets. The researchers estimated that the number of tornadoes in the most extreme outbreak in a five-year interval doubled over the last half-century. This means that in 1965 the worst outbreak expected over five years would have had about 40 tornadoes, while in 2015 the worst outbreak expected over five years would have had about 80 tornadoes. "Viewing the data on thousands of tornadoes that have been reliably recorded in the United States over the past half-century as a population has permitted us to ask new questions and discover new, important changes in outbreaks of these tornadoes," Cohen said. To understand the increased frequency in tornado outbreaks, the researchers looked at two factors: convective available potential energy, or CAPE, and storm relative helicity, which is a measure of vertical wind shear. Earlier studies had projected a warming climate would increase CAPE, creating conditions favorable to a rise in severe thunderstorms—and potentially tornado outbreaks. But Cohen and his colleagues found the increases in outbreaks were driven instead by storm relative helicity, which has not been projected to increase under a warming climate. "Our study raises new questions about what climate change will do to severe thunderstorms and what is responsible for recent trends," said co-author Michael K. Tippett, an associate professor at Columbia University's Fu Foundation School of Engineering and Applied Science. "The fact that we didn't see the presently understood meteorological signature of global warming in changing outbreak statistics for tornadoes leaves two possibilities: Either the recent increases are not due to a warming climate, or a warming climate has implications for tornado activity that we don't understand." Increasing tornado outbreaks—is climate change responsible? When New Orleans got hit, Reverend Pat Robertson said it was because of their sinning. What does he say about all of the world's biggest and deadliest tornadoes being inflicted on the Bible Belt? When I pointed out that the number of tornadoes per year was roughly 180 every year before 1950, but has skyrocketed in number now, I was told I was crazy by those here. They said the more tornadoes recorded comes from the population rising. But the population rose only about 200 percent since 1950, while the number of tornadoes rose about 600 percent. They were essentially saying the number of tornadoes was roughly constant, but that means there were a thousand or more tornadoes hiding somewhere in Tornado Alley, one of the most densely populated areas of the U.S., for more than half a century! Observation by Hubble shows the Sun is passing through a "clumpier" region of interstellar space, this could certainly be a result. Makes sense the pot bubbles harder when it gets warmer. I don't think AOGCMs have the resolution yet to talk about something as small as a mesocyclone. Conspiracy theory is a pathology. • Manipulated, hid or misrepresented data and evidence in official reports. • Blocked the publication of scientific results that contradicted the IPCC theory. • Expressed greater doubt in the emails about the science than they wrote in official reports. • Manipulated the peer-review process to get friends to review their papers. • Pressured scientific journals to reject papers showing evidence contrary to their theory. • Intimidated or discredited scientific journals that publish evidence contrary to their theory. • Conspired to destroy data and emails subject to Freedom of Information Act (FOIA) laws. Facts are AGW is going to deal a series of death blows to the Deniers in the Bible Belt. Think of it as an "Act of God".